Cabinet approves Interest Subvention to banks on Short-Term crop loan to farmers. New Delhi 14 May 2017: The Union Cabinet chaired by the Prime Minister Shri Narendra Modi has approved the Interest Subvention Scheme (ISS) for farmers for the year 2017-18. This will help farmers getting short term crop loan up to Rs. 3 lakh payable within one year at only 4% per annum. The Government has earmarked a sum of Rs. 20,339 crore for this purpose. 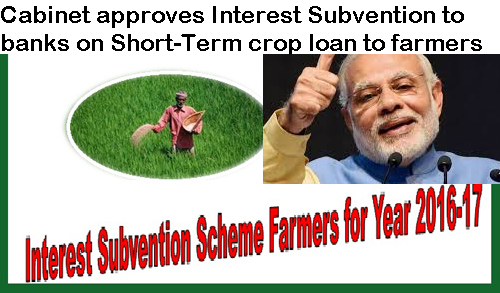 Cabinet approves Interest Subvention to banks on Short-Term crop loan to farmers. The salient features of the scheme are as follows: Major Impact : Background: Prime Minister Shri Narendra Modi has approved the Interest Subvention Scheme (ISS) for farmers for the year 2017-18. This will help farmers getting short term crop loan up to Rs. 3 lakh payable within one year at only 4% per annum. The Government has earmarked a sum of Rs. 20,339 crore for this purpose.